The murder of 10 people on the Mavi Marmara ship carrying humanitarian aid to the Gaza Strip in May 31, 2010 by Israeli soldiers was commemorated in several ceremonies across the country on Sunday. The daughter of one of those killed, Ali Haydar Bengi, said she was honored to be the daughter of such an individual who sacrificed himself to help others. Mehanur Altaca, speaking to Anadolu Agency in Diyarbakır, said the family had objected at first to her father's desire to join the expedition to Gaza. "But later he persuaded us. Over breakfast, he told us we would all be together in heaven if he became a martyr." She said she had continued her studies after her father's death and was trying to walk in his footsteps. Altaca's wife Seniye Bengi said she was proud of her husband and had done her best to instill the importance of education and sacrifice to their four children. "We always feel his presence," she added. The son of İbrahim Bilgen, who also lost his life in the Mavi Marmara attack, said he wanted justice. Yusuf Bilgen said the blockade on the Gaza Strip had to end and called for the judicial process launched against Israeli officials responsible to pick up pace. A photograph exhibition was held in the central Anatolian town of Kayseri in honor of Furkan Doğan, an American-Turkish dual citizen who died in the raid at the age of 19. Thousands of volunteers from across the country came to Istanbul to attend the demonstration held by the Human Rights and Freedoms (İHH) Humanitarian Relief Foundation, which had organized the humanitarian convoy led by Mavi Marmara in 2010. The group traveling from Konya stopped at Ankara early on Sunday and held a prayer in front of the Israeli Embassy. Scores of Palestinians on Saturday marked the anniversary of the deadly attack. 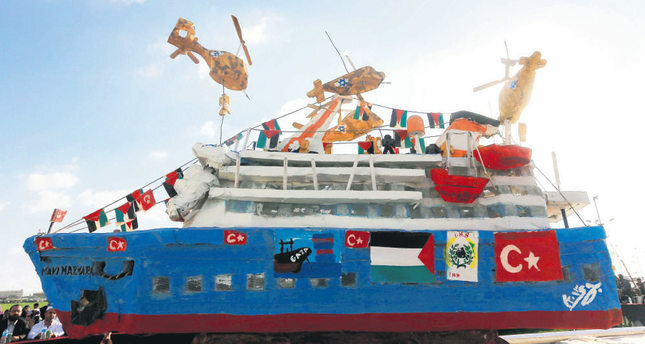 Ten activists were killed on board the Turkish aid flotilla Mavi Marmara in May of 2010 when Israel's navy attacked the ship as it sought to break Gaza's blockade that has been in place since 2007. Mehmet Kaya, the representative of the İHH, said the people who gathered on Saturday only wanted to remember their brothers who were killed in 2010 in their attempt to deliver humanitarian aid to Gaza. "The blood of the martyrs of Mavi Marmara will not go in vain," Kaya told Anadolu Agency. He said his foundation would not stop supporting the Palestinian people, calling on the Palestinians to stay united in order to liberate their country. Senior Hamas figure, Bassem Naeem, meanwhile, said the Mavi Marmara attack was "seminal" in the history of the nation. He called for bringing Israel to court for the killing of the Turkish activists on board the Turkish aid ship and also committing crimes against the Palestinian people for decades. Naeem said Turkey had contributed millions of dollars in support for the Palestinian people and also offered political, diplomatic and media support. Six civilian ships in the aid flotilla were attacked in international waters by Israeli forces on May 31, 2010, as they tried to break Israel's blockade of the Gaza Strip. Nine Turkish activists were killed and 30 other people injured, including one activist who died nearly four years after being critically injured. In May 2014, Istanbul's 7th High Criminal Court ordered the arrest of four Israeli officials – former Chief of Staff Gabi Ashkenazi, former navy chief Eliezer Marom, former head of military intelligence Amos Yadlin and former air force intelligence chief Avishai Levy – who are being tried in absentia. Istanbul's public prosecutor's office demanded that the suspects be sentenced to prison terms amounting to a total of 18,032 years. The İHH had appealed in January 2014 against an International Criminal Court decision not to investigate the deadly Israeli raid on the Mavi Marmara. However, in November, the court announced it would not investigate the maritime incident between pro-Palestinian demonstrators and Israeli forces due to a lack of "sufficient gravity. The raid raised tensions between Israel and Turkey, which recalled its ambassador from Tel Aviv. The government demanded an apology, compensation for the victims and the lifting of the Gaza blockade to re-establish relations. An apology by Prime Minister Benjamin Netanyahu in 2013 was not followed by an agreement on compensation or the total lifting of the blockade on Gaza and consequently bilateral ties remain at a low level.